Since 1994 a survey of Purbeck marble coffin-shaped slabs has been serialised in the Newsletter. Although only English counties have been published to date, the Survey includes slabs wherever they occur and a few are known from the continent. During a visit to Dublin by the authors in March 1998, a check was made of the grave slabs preserved in the crypt of Christ Church Cathedral. One of these was known from previous observations to exhibit features recognisable, from the Survey, as being characteristic of Purbeck marble slabs. In the event, two of the slabs in the crypt were found to be of this material. What was completely unexpected, however, was the discovery, during the same visit, that the .two of the medieval effigies at Christ Church were also Purbeck marble, together with a third figure in St Patrick's Cathedral and an excavated fragment of a fourth from the collection of the National Museum of Ireland, on exhibition in Dublin. A further visit, in July 1998, added to this list a civilian effigy at St Audoen's, a third coffin-shaped slab and a coffin (the latter two in the churchyard of St Patrick's). The five Purbeck marble effigies in Dublin are probably the largest concentration outside London. Irish medieval figure sculpture has been the subject of a very thorough study, including some petrological identification, but none has previously been identifies as being carved in this Dorset limestone. In 1970 D M Waterman refuted earlier suggestions by Sir Thomas Drew that Purbeck had been used extensively for shafts at Christ Church, Dublin. More recently, a Purbeck slab with indents for a monumental brass with a separate letter inscription has been noted at trim. On the other hand, it is known that indigenous sources of polishable limestone, eg from quarries in the area of Kilkenny, was used both for architectural elements and monuments. The availability of native alternatives to Purbeck would have reduced the market for an imported stone. 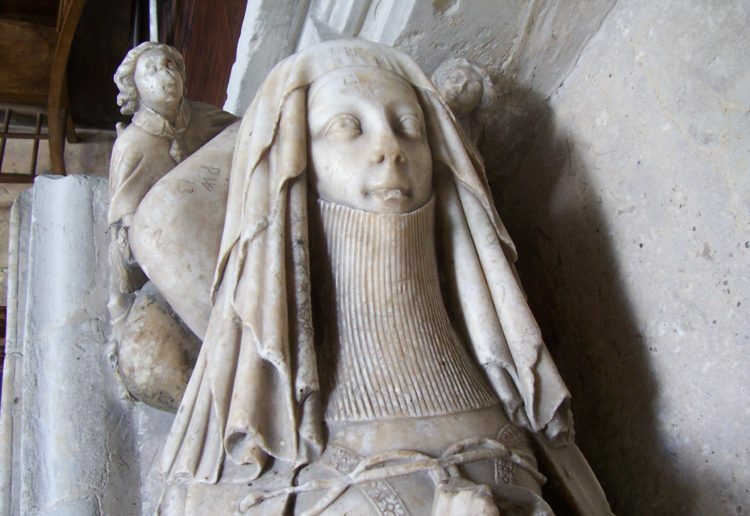 Against this background, the recognition of eight medieval monuments and a coffin in Purbeck marble is highly significant in an Irish context and has important consequences for the wider distribution of such products and patterns of trade. This paper puts on record the new evidence and briefly considers the implications. An excavation at 10-18 London Bridge Street was carried out by staff of the Museum of London Archaeological Service in September/October 1997. A sequence of deposits from the Roman to the medieval period was discovered. The latest structure in the excavation was a fifteenth century cellar/cesspit constructed from chalk, flint and sandstone. Within the fabric of the remaining two walls were two reused Purbeck marble grave slab fragments, one of which was inscribed. Since the recent notification of the find in April's Ecclesiology Today, some changes have been made following further research by the author and comments on the grave slabs by Sally Badham. Publication of the site, including further refinements to the chronology using cartographic and documentary sources is in preparation for the London Archaeologist (P Askew with S Badham & S Humphreys, 'Excavation at 10-18 London Bridge Street' forthcoming. Both are adult slabs and made from Purbeck marble carved at or near one of the quarries of Corfe in Dorset and marketed locally and through the marblers' workshops in London. A section of 'A French (Normandy or Brittany) stone panel from a tomb – early fifteenth century' was offered for auction by Sotheby's in New York. The sale catalogue description continues, '…carved in low relief with alternating male and female saints, within trefoil pointed arches, a partial inscription in French below, losses and extensive wear, repaired crack, mounted on a later metal stand, 13.25" by 32.375".' Its presale estimate was $10 – 12,000 but reportedly it was sold after the sale for $5,000. Stothard toured France to draw monuments for his projected Monumental Effigies in France in the years 1816-18. Two albums of his unpublished drawings are described. Stothard's journeys and explorations are recalled thought his widow's memoirs and letters. 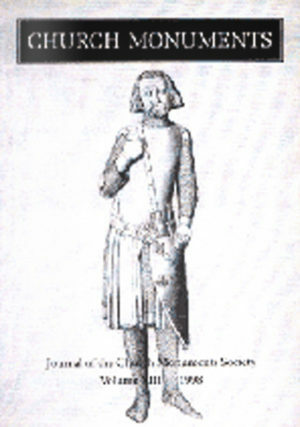 Describes the four Boyle tombs and interprets the messages relayed by them about Boyle and his family to early seventeenth century society both in England and Ireland. Analyses the significance of allegorical figures on early seventeenth century monuments which replaced more conventional representations of the Virtues.